"Izzy" Stone was one of the very few prominent Americans who outspokenly pressured the Roosevelt administration to aid Jewish refugees fleeing Hitler. In the war's early years, when many Americans preached isolationism, this maverick journalist lashed out at monopolistic interests in the U.S. whose profiteering jeopardized our national defense. Aside from their courage, these columns and essays reprinted from the Nation show admirable prescience. For example, Stone criticized U.S. State Department interference that weakened the Allies' efforts to jointly punish Nazi war criminals. Visiting Palestine in late 1945, he sharply warned that the creation of a Jewish state would sow seeds of divisiveness unless Arabs' needs for self-development were met. He excoriates widespread poverty in the U.S., bad housing, outbreaks of racial violence, corruptionissues that plague us today. Much of Stone's muscular prose has a contemporary zing: "Chicago is magnificent, a brutal force, an imperial city." These pieces meld into a vivid newsreel that throws light on the 1940sand the '80s. 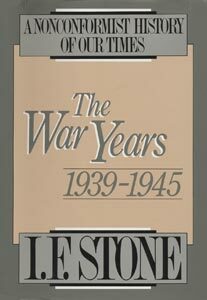 Stone's no-holds-barred journalism sparkles in this collection of columns, the first of a series of six books compiling his articles published previously. This first compilation covers those works that appeared in The Nation during World War II; the last of the series, to be published next year, will feature columns published up to 1970. While it is fortunate that the editors decided to publish the essays without abridgement, today's readers will find some of them perplexing as they frequently deal with lesser known figures or events. There are no introductions to the selections, and the few footnotes provide only marginal help. Criticism aside, the book is a delight to read. Political commentary at its best. Charles K. Piehl, Mankato State Univ., Minn.